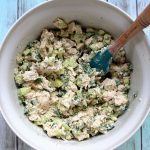 This recipe for lightened-up Cucumber Dill Greek Yogurt Rotisserie Chicken Salad comes together in less than 10 minutes and tastes like summer in a bowl thanks to crisp cucumber and flavorful herbs. Made with Greek yogurt, it’s a protein-packed salad that will fill you up without making you feel weighed down! Important note: If you are making this Greek yogurt rotisserie chicken salad recipe ahead of time, wait to add the cucumber until right before you serve it to prevent the salad from getting too watery and preserve the crispness of the cucumber. I highly recommend using leftover rotisserie chicken (as the recipe notes) in this salad as the depth of flavor is more intense than canned chicken (bleh) or even plain grilled chicken. I used full-fat Greek yogurt in this recipe to keep it creamy without sacrificing flavor. You could use a lighter version of Greek yogurt but I’d recommend using a 1:1 ratio of Greek yogurt to mayonnaise if you make this swap.